Who makes the best shuffleboard tables? In this article, we’ll show you six of the best Shuffleboard Table Brands that stands amidst giants like Olhausen and Champion. There are plenty of cheap shuffleboard tables out there that are made of flimsy materials. The brands we’ll cover today are known for their durability, craftsmanship, and quality materials. The 22″ Dominator Shuffleboard Table by Hudson. One of the best tables in the world! Update: This article was last updated in 2018 to reflect what’s currently in market. Hudson Shuffleboards are some of the best in the industry. In fact, Hudson shuffleboard tables are endorsed by Billy Mays, 25 Time World Champion Shuffleboard player. That says a lot about the build, surface finish, and resilience of these tables. Hudson is one of the only shuffleboard manufacturers in the world that pours the finish with the climatic adjusters attached to the board. This does two things: 1) It allows the boards to be leveled length-wise and side-to-side. This creates a perfect playing surface that’s ready to go out of the box. Each table is poured and adjusted to .001” and then shipped out. This way, they’re already leveled to precision when you get them. What other company stands behind their products with a Lifetime Warranty? 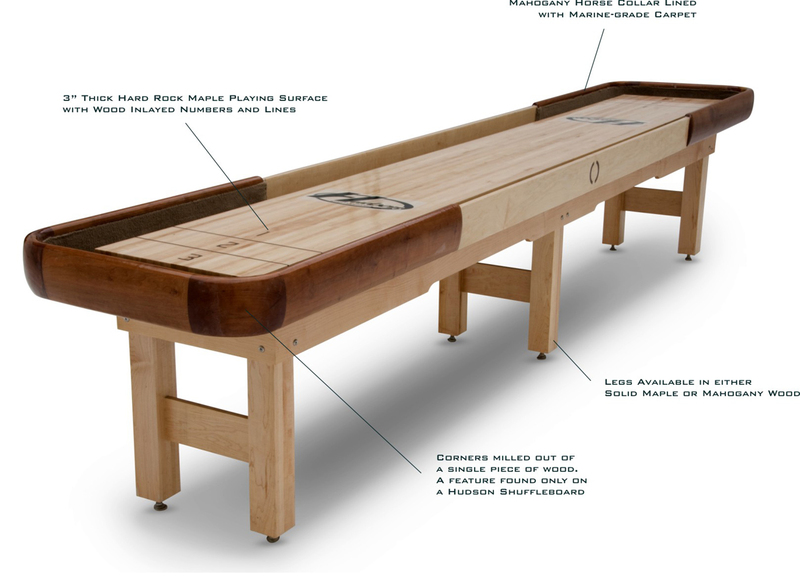 Hudson shuffleboard tables are made right here in the US and are all capable of being customized. Hudson makes the following tables: Berkley, Grand Hudson Deluxe, Grand Hudson, Cirrus, Intimidator, Commercial, Torino Limited, Newcastle Limited, Octagon, Metro, and the Dominator. The only planks on the market that are reinforced with maple inlays on the bottom, where each climatic adjuster is located. True 90 degree edge (not beveled) along the rails. This lets weights “hang” off the rail instead of falling off. More hangers! 3” Thick kiln dried maple playfields prevent warping, cracking, and sagging. Polymer Finish is backed by a lifetime warranty. Infused with a UV additive that keeps the table from turning yellow over time. This is common in other epoxies. Offer Indoor and Outdoor Shuffleboard Tables. Each table is available to be personalized with a custom logo. 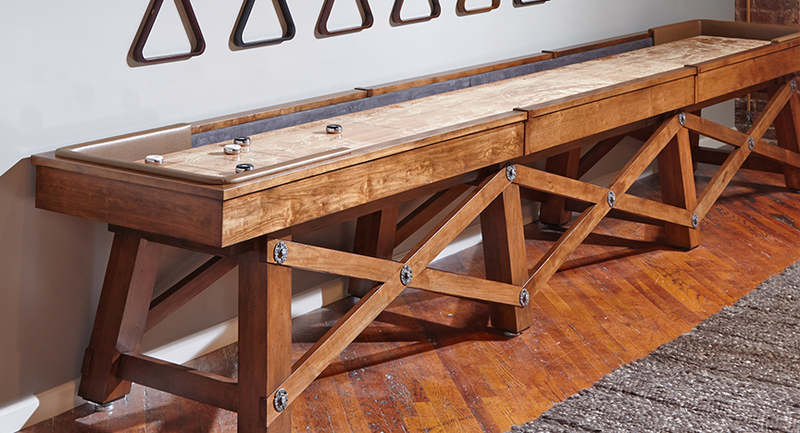 The 22′ Chicago Shuffleboard Table by Venture Shuffleboards. Venture Shuffleboard Tables is an established brand that has been in business for nearly 20 years with a knowledge to the 1930’s. They’ve carved out a name for themselves as one of the most renown companies, building top notch shuffleboard tables. All Venture shuffleboard tables are made in the United States. Venture tables come with a lifetime warranty on both the playfield and the cabinet. Venture playfields are all finger jointed, they are hidden by turning them on their side, like has been done for decades before. Venture shuffleboard table makers apprenticed under a team of “shuffleboard heirs.” The way they build and more specifically why they build things is different than any other shuffleboard manufacturer. They utilize only the highest cabinet grade plywood for all our sub-frames that are specifically designed to compliment the playfield, which is the heart of the table. Cabinets can look very different but their purpose is the same in a Venture table; to act in balance with the playfield to produce a consistently good playing table. These are factors that are taken into account on a cellular level of Venture playfields and cabinets and finishes so that everything is moving together vs. against one another. Venture shuffleboard tables check all of the boxes. Hard rock maple is finishes with specially formulated synthetic lacquers. They offer tables that come equipped with solid wood cabinets to add stability to the table. Venture offers many models including the Ambassador, Challenger, Chicago, Classic, Burlington, Grand Deluxe, Saratoga, and Savannah. The 18′ Loft Shuffleboard Table by California House. California House is an artisan woodworking business at it’s core that lends it’s talent to making some of the most memorable shuffleboard tables with original designs inspired by the surroundings of an artists every day life. In business since 1953, California House has is known for making fine furnishings with high attention to detail. If you want an elegant and genuine table that is aesthetically appealing, there is likely a table from their collection that will fit your liking. Richly decorative, California House shuffleboard tables are characterized by deep wood tones, natural finishes, and one-of-a-kind designs. For the utilitarian, California House makes their tables from beech wood instead of maple to offer a more rigid and shock resistant playfield. Other build features include double tongue groove planks, two-part polymer finishes that resist yellowing, and custom made in-house climatic adjusters. Some of their most popular tables are the Loft, the Hillsborough, and the Newport. 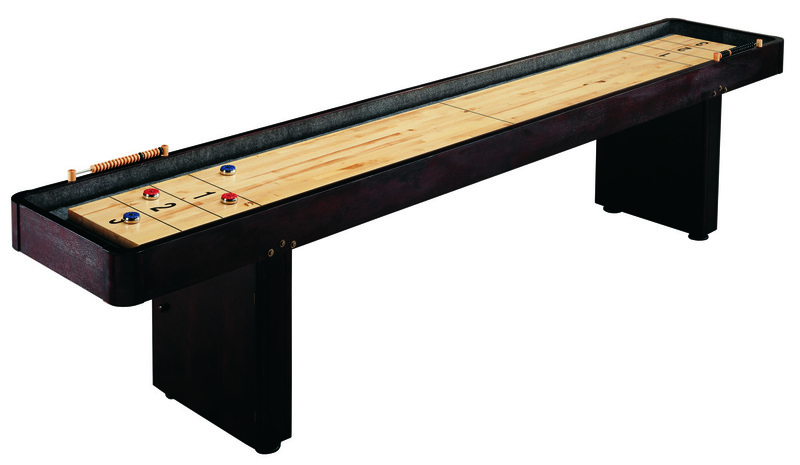 View all California House Shuffleboard Tables here. The 12′ Level Best Shuffleboard Table by C.L. Bailey Co..
Now you might be wondering who in the heck C.L. Bailey Co. is. That’s exactly why you need to be reading this page. 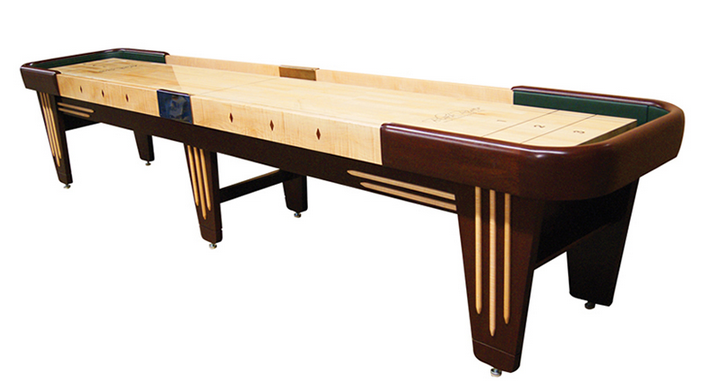 C.L Baily Co. is one of the home recreation industry’s largest billiard and game room furniture suppliers. This father and son due, Charles and Chuck Bailey, started by making billiards tables way back in the day and then expanded into their new brand, The Level Best. C.L. Bailey Co. was acquired by Armand Billiards Group in 2007. Ring a bell? Armand is a part of Armand Capital Group which just so happens to be owned by Saluc SA, the makers of Aramith Billiards Balls. Follow me? If you know anything about pool, you know that Aramith makes the best billiards balls period. In this context, you get an idea of the caliber that C.L Bailey Co. is. Although they were acquired a few years back, Charles and Chuck continue to be involved in operations as part of an investment group. View C.L. Bailey Co.’s Level Best Shuffleboard Tables. A list of the best shuffleboard tables is not complete without McClure. Although we do not carry this brand, we have to give a nod to McClure as another heavy contender. McClure makes all of their shuffleboard tables by hand and allow custom ordering. 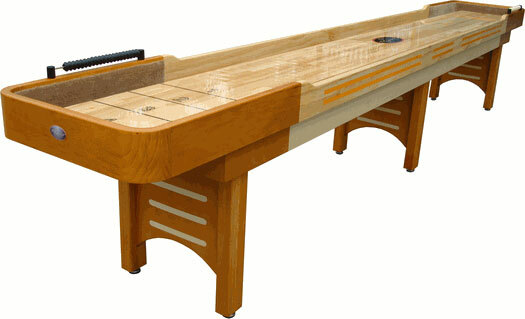 They offer a stock of pre-made shuffleboard tables and personalized tables that are made to order. They’re a very transparent company that allows rare access to behind the scenes footage of their manufacturing process. McClure shuffleboard tables use hard rock maple and laminate playing surfaces. They also have their own unique polymer finish that was developed with manufacturers. McClure is one of the best shuffleboard table brands based upon quality, craftsmanship, and pure dedication to the sport. The 16′ Honey Maple Coventry Shuffle Board Table by Playcraft. Playcraft doesn’t make the best shuffleboard tables in the world. It would be insane to argue this point with some of the other brands mentioned on this list out there. However, Playcraft is one of the best shuffleboard table brands because they offer the best value. 19If you’re shopping on a budget, you’ll want to look at Playcraft tables. Playcraft is a reputable brand and that’s been in business since 1975. Their tables have withstood the test of time and can be a viable option for those seeking an economical solution for their home game room. If you want a shuffleboard table just to play on, this is the brand for you. Their models include the Vintage, Telluride, Georgetown, Woodbridge, and the Coventry. They also have an outdoor shuffleboard table available called the Extera. Shuffleboard.net carries Hudson, C.L. Bailey Co., Venture, and Playcraft. We only carry the very best shuffleboard tables and accessories to cater to moderate and advanced players. Shuffleboard.net offers Free Shipping on all orders. Visit our site to shop for shuffleboard tables by size or you can shop by model. 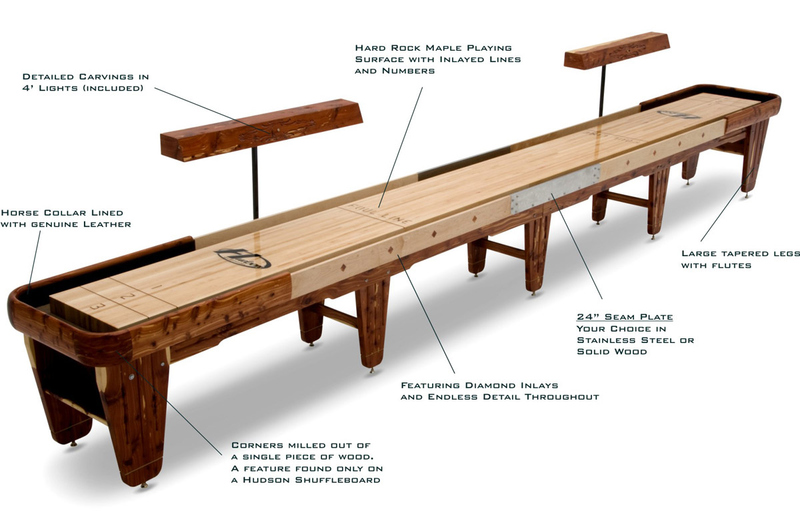 Speak to a shuffleboard specialist to help find you the perfect table for your needs by calling 1-888-565-7180. This entry was posted in Shuffleboard Tables by admin. Bookmark the permalink.